This past week a briefly snoozing Nia and I met up with fellow Wellesley alum Solie B. and enjoyed lunch at one of my favorite cafes Bouchon. Nia's gone there with me a few times before, and she was a doll this time although the time prior was a bit problematic. Anyway, I enjoyed a ham and cheese and for dessert decided to try a macaron at the bakery, which stands apart from the cafe. There is nearly always a line at the bakery and this time was no exception. The menu with flavors isn't on the wall, but instead one must peer into the case to make a selection. Being the Type A person that I am, I decided to take a scientific approach and go by which macaron trays were most empty. There were none left of pistachio, all of the rhubarb seemed to be there as well as most of the vanilla, but only a few chocolate were left so I asked for one of them. I also decided to get a cup of coffee. Honestly, I should have sat down to prepare myself for the goodness I was about to partake in. That chocolate macaron made me want to cry. I think even Nia, wrapped in her Moby, could sense my emotion. She was silent and looked up quietly at me while I savored my macaron and sipped my coffee in between tiny bites. The crispy outside contrasted with the silky, buttercream inside was so divine. I wanted to stand from the top of the third floor railing where the bakery is located and declare: "GOD BLESS THE FRENCH!" Oh! The coffee was delicious too; much better than Starbucks, and it was the perfect accompaniment to the chocolate flavor of the macaron. Now I have heard of macarons before and spelled it as "macaroon" when I tweeted about its goodness, but after a bit of research I found that they are not synonymous. 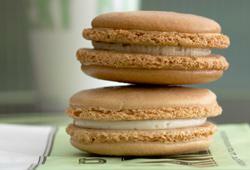 Macaroons are the super sweet balls of coconut which, while tasty, pale in comparison to the complexity of macarons. Since enjoying my first macaron I was directed to this blog post courtesy of Elle Decor detailing how to make your own (as well as a link to a proper pronunciation guide for those of us who are Type A!). I will certainly be trying this recipe, and I think it might be fun to invite my sisters over to make them together. Now that would make a fun blog post! 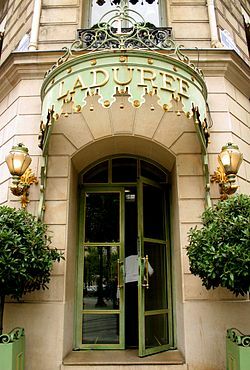 Someday I hope to make it to Ladurée in Paris, which is an old school bakery that supposedly has the best macarons in the world. Laduree does have the best macarons! So delish. I'm obsessed with them as well.